Widely naturalized (GRIN). Naturalized in Madagascar (efloras). Has naturalized across the United States, Europe, Asia and other parts of the world (Learn 2 Grow). Learn 2 Grow (2015). Learn 2 Grow. Widely naturalized (GRIN). Naturalized in Madagascar (zones 10a-13b) (efloras). Has naturalized across the United States, Europe, Asia and other parts of the world (Learn 2 Grow). Overlap with California's Climate Zones (Cal-IPC). Invasive in China (all zones 1a-11b), Ecuador (zones 10a-13b), Taiwan (zones 9a-11b) (PIER). “Thornapples…are of most importance in Queensland and northern New South Wales where they compete with many crops. Mung beans and soybeans are seriously affected and yield losses of up to 90% have been recorded.” Serious impact on quantity. Primarily a weed of cropping, control can be achieved by repeated cultivations. Thornapple plants produce a large amount of seed and seeds remain viable for more than 30 years, therefore, control is a long-term exercise. With the serious impact this plant can have on agricultural production and the time to control or eradicate it, land values may be greatly affected (Victoria zones 7a-9b) (Victorian Invasive Plants). Widely distributed weed of disturbed land. A weed of summer crops (Weeds Australia). Victoria Dept. of Environment and Primary Industries (2015). Victorian Invasive Plants. Australian Weeds Committee (0). Weeds Australia. Invasive in China (all zones 1a-11b), Ecuador (zones 10a-13b), Taiwan (zones 9a-11b) (PIER). “Thornapples…are of most importance in Queensland and northern New South Wales where they compete with many crops. Mung beans and soybeans are seriously affected and yield losses of up to 90% have been recorded.” Serious impact on quantity. Primarily a weed of cropping, control can be achieved by repeated cultivations. Thornapple plants produce a large amount of seed and seeds remain viable for more than 30 years, therefore, control is a long-term exercise. With the serious impact this plant can have on agricultural production and the time to control or eradicate it, land values may be greatly affected (Victoria zones 7a-9b) (Victorian Invasive Plants). Widely distributed weed of disturbed land. A weed of summer crops (Weeds Australia). Substantial overlap with California climate zones (Cal-IPC). D. stramonium is a weed of disturbed areas and summer crops in Australia (zones 8a-13b); D. tatula is a purple form of this species (Weeds Australia). D. stramonium is weedy (Learn 2 Grow). D. ferox and D. metel (possibly synonym for D. inoxia) are weeds in Australia (PIER). D. stramonium is a weed in California (UC IPM). Obvious clear overlap with California's climate zones (Cal-IPC). Regents of the University of Calfornia (2014). University of California Agriculture and Natural Resources Statewide Integrated Pest Management Program (UC IPM). Distributed extensively in the southern US, South America, Africa (particularly western and southern regions, and some in the eastern region near Kenya), densely in the Mediterranean region, throughout Australia, and sporadically elsewhere (GBIF). Thorn apple (recurved) prefers warm-temperate and sub-tropical regions, mainly in open, warm situations and on fertile soils. It is often found on river flats, stock yards and competes strongly with summer crops. The weed is tolerant of water logging and drought (Agriculture Victoria). Clearly overlaps substantially with California's climate zones, and grows primarily in areas matching California's Climate Zones (e.g., Mediterranean regions, and California) (Cal-IPC). Compete strongly with summer species for moisture and nutrient. Not known as a serious weed of natural ecosystems. Major displacement of annual grasses/ground covers. “Dense infestations occur in pastures and on river flats, producing a complete ground cover.” Likely to have a major impact on plants in the lower stratum (Victorian Invasive Plants). Thorn apple (recurved) competes strongly with summer species for moisture and nutrients. Although it displaces annual grasses, ground cover and riparian vegetation, it is not known to be a serious weed of natural ecosystems. Dense infestations occur in pastures and on river flats, producing a complete ground cover. The plants die in the cooler autumn weather. However, dead plants bear capsules that may remain standing through winter into spring (Agriculture Victoria). While perhaps not dominant year-round, can dominate plant communities in the summer at the very least, and standing skeletons may alter plant communities. The plants die in the cooler autumn weather, but dead plants bearing capsules may remain standing through winter into spring.” Potential for a minor change in the frequency of fire risk within dense patches (Victorian Invasive Plants). An exhaustive Google/Google Scholar search did not reveal any additional evidence of this and the question defaults to a “no” answer at this time. All parts of the plant are poisonous; covered with numerous slender spines. All parts of Datura plants contain dangerous levels of poison and may be fatal if ingested by humans and other animals, including livestock and pets (EOL). All Datura plants contain tropane alkaloids such as scopolamine, hyoscyamine, and atropine, primarily in their seeds and flowers. Because of the presence of these substances, Datura has been used for centuries in some cultures as a poison. There can be a 5:1 toxin variation between plants and a given plant's toxicity depends on its age, where it is growing, and the local weather conditions. These variations makes Datura exceptionally hazardous as a drug. In traditional cultures, a great deal of experience with and detailed knowledge of Datura was critical to minimize harm. Many tragic incidents result from modern users ingesting Datura. For example, in the 1990s and 2000s, the United States media contained stories of adolescents and young adults dying or becoming seriously ill from intentionally ingesting Datura. There are also several reports in the medical literature of deaths from D. stramonium and D. ferox intoxication. Children are especially vulnerable to atropine poisoning. Datura toxins may be ingested accidentally by consumption of honey produced by several wasp species, including Brachygastra lecheguana, during the Datura blooming season. It appears that these semi-domesticated honey wasps collect Datura nectar for honey production which can lead to poisoning. In some parts of Europe and India, Datura has been a popular poison for suicide and murder. 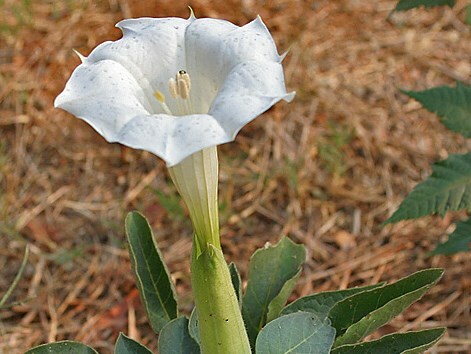 From 1950 to 1965, the State Chemical Laboratories in Agra, India, investigated 2,778 deaths caused by ingesting Datura. The US Centers for Disease Control and Prevention reported accidental poisoning resulting in hospitalization for a family of six who inadvertently ingested Datura used as an ingredient in stew (Wikipedia). Devils trumpet grows naturally in disturbed areas such as eroded sites, old fields, vacant lots, overgrazed pastures and rangeland, roadsides and abandoned roadbeds, and fencerows (PIER). Dense infestations would have a minor effect on aesthetics. However, as the leaves produce an unpleasant odour when crushed and the fruit is armed with spines, some recreational activities may be affected. “Dense infestations occur in pastures and on river flats, producing a complete ground cover.” Likely to have a major impact on plants in the lower stratum. “Dense infestations occur in pastures and on river flats, producing a complete ground cover.” Likely to reduce available fodder for fauna species (Victorian Invasive Plants). All parts of the plant, particularly seeds, are toxic to livestock and humans. Rank smell and bitter taste usually deters stock from grazing plants (Weeds Australia). Dense infestations occur in pastures and on river flats, producing a complete ground cover. The plants die in the cooler autumn weather. However, dead plants bear capsules that may remain standing through winter into spring (Agriculture Victoria). Reports of human poisoning have occurred (CDC). All members of this genus contain narcotics and are very poisonous, even in small doses (PFAF). Encyclopedia of Life (0). Encyclopedia of Life (EOL). U.S. Department of Health and Human Services (0). Centers for Disease Control and Prevention (CDC). Plants for a Future (2012). Plants for a Future (PFAF). Typically reaches a height of 0.6 to 1.5 metres (EOL). Erect annual or sometimes perennial herb, commonly 30 to 60 cm high. Unlikely to affect human access to recreational areas (Victorian Invasive Plants). An exhaustive Google/Google Scholar search did not reveal any evidence of this and the question defaults to a “no” answer at this time. In all localities in Croatia, D. inoxia occurs in a large number regenerating well from both the seed and the root (Current state of the distribution of the species Datura inoxia Miller (Solanaceae) in Croatia). When cultivated, the plant is usually grown from seed, but its perennial rhizomes can be kept from freezing and planted in the spring of the following year (TrekNature; Floridata). Franjić, J., & Trinajstić I. (1996). Current state of the distribution of the species Datura inoxia Miller (Solanaceae) in Croatia. Fragmenta phytomedica et herbologica. 24, 5–9. Spread by seed with some dispersal as cut root pieces (Weeds Australia). When cultivated, the plant is usually grown from seed, but its perennial rhizomes can be kept from freezing and planted in the spring of the following year (TrekNature; Floridata). In all localities in Croatia, D. inoxia occurs in a large number regenerating well from both the seed and the root (Current state of the distribution of the species Datura inoxia Miller (Solanaceae) in Croatia). Seeds numerous (EOL). Thornapple plants produce a large amount of seed and seeds remain viable for more than 30 years, therefore, control is a long-term exercise (Victorian Invasive Plants). An exhaustive Google/Google Scholar search did not reveal any additional evidence regarding this and it defaults to remain unanswered at this time. Thornapple plants produce a large amount of seed and seeds remain viable for more than 30 years, therefore, control is a long-term exercise (Victorian Invasive Plants). Seeds of the thorn apple (recurved) require a period of 5-11 months after ripening before they germinate. Dormancy is influenced by a chemical inhibitor in the seedcoat, which must be leached out or broken down before germination occurs. Seeds are long lived with one experiment showing 91 per cent of seeds surviving 39 years after burial (Agriculture Victoria). Time to ultimate height only 1 year (RHS). Likely that seeds are produced within the first year, as it acts as an annual, but has a perennial rootstock (EOL). [Anonymous] (2014). Royal Horticultural Society Plant Selector. Fl. and fr. Jun-Sep. It flowers from early summer until late fall (EOL). Blooms March - October (Lady Bird Johnson Wildflower Center). Lady Bird Johnson Wildflower Center (2016). Lady Bird Johnson Wildflower Center. The fruit is an egg-shaped spiny capsule, about 5 cm in diameter. It splits open when ripe, dispersing the seeds. Another means of dispersal is by the fruit spines getting caught in the fur of animals, who then carry the fruit far from the mother plant (EOL). The seeds are distributed by ants and some species of birds that are resistant to the chemicals they contain (PIER). Seed capsules spined (Lady Bird Johnson Wildflower Center). Both the seeds and capsules float on water, which provides an effective means of dispersal (Agriculture Victoria). Listed as potential weed seed contaminant (ARS GRIN). The fruit is an egg-shaped spiny capsule, about 5 cm in diameter. It splits open when ripe, dispersing the seeds. Another means of dispersal is by the fruit spines getting caught in the fur of animals, who then carry the fruit far from the mother plant (EOL). Seed capsules spined (Lady Bird Johnson Wildflower Center). “Thornapple seeds are difficult to separate from seeds of grain sorghum…and contaminated samples are downgraded or rejected.” Produce rejected for sale (Victorian Invasive Plants). Most of the weed is spread through the contamination of agricultural seeds. Seeds are also dispersed via machinery, vehicles and mud. Pieces of root of the plant's perennial species are also dispersed when dragged by cultivation equipment (Agriculture Victoria). The scientific name is often cited as D. innoxia. When English botanist Philip Miller first described the species in 1768, he misspelled the Latin word innoxia (inoffensive) when naming it D. inoxia. The name Datura meteloides was for some time erroneously applied to some members of the species, but that name has now been abandoned.